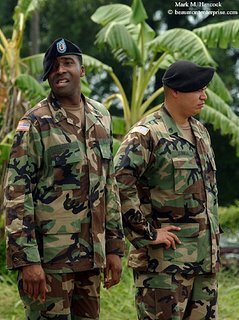 Staff sergeants Ronsoni Long (left) and Jesus Zuniga (right) of the Houston Recruiting Battalion supervise U.S. Army recruits at the American Legion Post in Beaumont on Saturday, July 16, 2005. The recruits also toured the Port of Beaumont and viewed military equipment. According to one stat counter, this blog officially hit 500,000 hits today. First and foremost, Thank YOU. Without y'all visiting, this blog is nothing more than a depository for thoughts and images. I'd also like to thank the folks who regularly comment and help me keep my info on track. I'd also like to thank everyone who has e-mailed questions. Many of the posts are answers to theses questions. I may be slow in forming the answers into a semi-coherent post, but I do try to answer quickly and briefly when asked a specific question. Many thanks and my admiration go to all the award-winning shooters who've given their time and knowledge through extremely long interviews. Thanks also go out to all the assignment subjects who've allowed me make images and document moments of their lives. I started this blog to convince Fayrouz to start one. Blogs and the war in Iraq were news then. I felt it was important for her to let people know about her native country and its people. When we both started blogging, we couldn't post images. So, this blog started as a text-only description about a middle-of-the-road PJ's life. It's still about a middle-of-the-road PJ's life. But, I'm a relatively happy middle-of-the-road PJ. Somehow, y'all decided to let this blog grow. I'm still surprised about its acceptance. The blog has taken on a life of its own and has won a few awards by itself. So what's next? I honestly don't know. However, I do have some ideas about what I'd like to try. After I wrote enough posts, I thought a book deal would be a cool idea. However, I don't wish to pull the content from this site to increase book sales. So a book deal probably won't happen unless I self-publish. It could happen, but I won't hold my breath until then. Meanwhile, I'm working to arrange some interviews and, as always, I have epic-length posts in the works offline. Expect to see more posts about sports, legal issues, business issues, some how-to posts and more biographies about former and contemporary photographers. For those new to the biz or really bored, I'm trying to make myself catch up on the PJ Glossary blog. It would be great if I could force myself to actually post each day there, but I haven't noticed any flying monkeys lately. 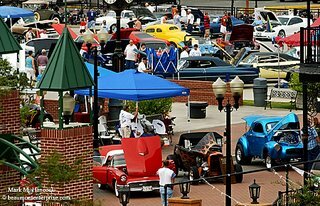 Local readers might also consider a peek at the Beaumont Events blog. Since we like Beaumont and plan to stay here, it's being updated more regularly than immediately after Hurricane Rita. For PJs who regularly read this blog, I'll let y'all in on a secret: The events blog also lists major photo contest deadline dates as they're nailed down. New Orleans native Kyra Isidore, 13, (left) snatches the television remote control away from her sister Katlin Isidore, 9, (right) at their temporary home in Beaumont on Wednesday, May 17, 2006. The Isidore family found an apartment in Beaumont after Hurricane Katrina and stayed through the school year. They will return to New Orleans to be with their father next week although their former school remains destroyed. 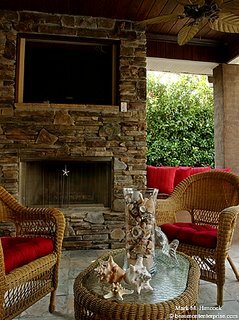 Mike and Myla Ramsey's outdoor dining area features a kitchen, entertainment center, fireplace and more to keep them comfortable all year in Beaumont on Wednesday, June 14, 2006. The Ramsey's outdoor dining area features a kitchen and bar area for casual entertaining. 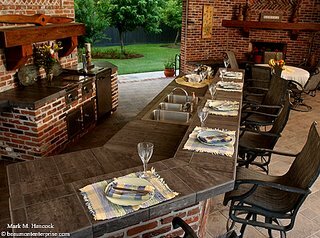 Five diverse local businesses are working together to deliver outdoor entertainment environments for upscale clients. The Ramsey's dog also frequents their outdoor dining area and swimming pool. 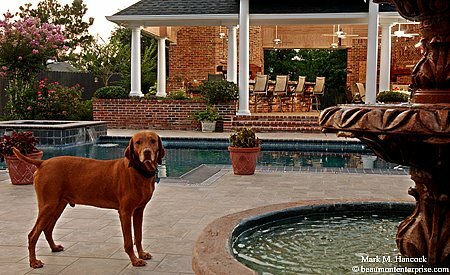 Home and pool builders are working with appliance vendors, custom audio and video dealers, as well as landscapers to develop vacation destinations for homeowners. The Ramsey's outdoor dining area also features mechanical doors to block northern winds and retain fireplace heat in the winter. 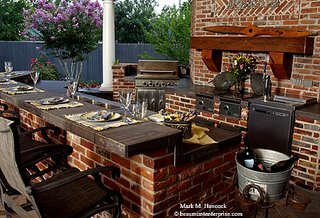 Curtis and Julie Thorpe's outdoor dining area features a kitchen, entertainment center, fireplace and more to complement the garden environment in Beaumont on Wednesday, June 14, 2006. 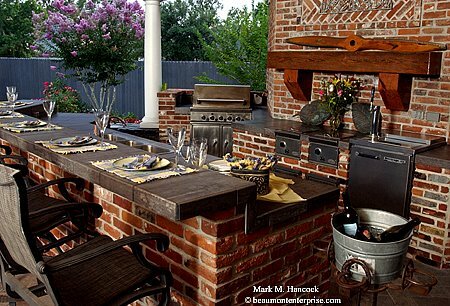 The Thorpe's outdoor dining area features a protected entertainment center with a mechanical door. Since 9-11, the societal trend, called cocooning, includes making a home oasis rather than spending the same money on luxurious trips. 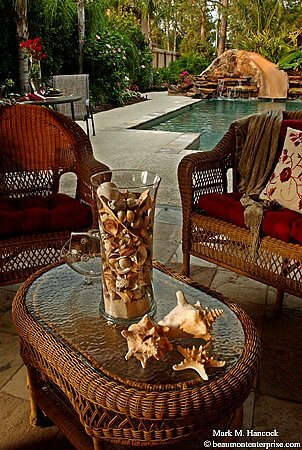 The Thorpe's outdoor dining area features a seascape motif in addition to it's garden appeal. In addition to travel-related stress savings, property values increase with each investment. Ed note: this post is about a subject that is NOT photojournalism. It's actually the exact opposite. Some PJs, particularly freelancers, accept commercial gigs to help pay the bills and stay in the biz without starving. Others finance their more ambitious journalistic endeavors with income earned from commercial gigs. Staffers should check with their employers to know company policies BEFORE considering freelance commercial gigs. Most people understand the difference between television news and television commercials. Most people also understand the difference between editorial photojournalism and advertising. As TV ads are called commercials, the photography used in print advertising is called commercial photography. The point of commercial photography is to increase commerce by selling products and/or brand recognition. Often, this is accomplished by simply showing the product in flattering light. Occasionally this is done by showing something other than the product. Drug manufacturers often employ flowers, waterfalls, meadows, etc. rather than a photo of a pill or box of pills. More recently, this trend has included sports-related products. Often, a subtle placement of the company's logo is all that distinguishes an ad from an editorial photo. Oh yeah, and the fact that the image is absolutely perfect - the light, the placement of elements, the colors, the layers, etc. In other words, it's fiction. Elements couldn't possibly exist as harmoniously as they appear in commercial photographs. As long as everyone knows the images are fiction, it's OK.
Why hire PJs for commercial shoots? I don't do many commercial shoots. However, when it won't conflict with my newspaper work, I like to accept the challenge and enjoy the creative license. High-end commercial shooters are worth every penny when it comes to large, product-based national ads. These shooters have hugely expensive equipment and lighting expertise for delicate, complicated projects. However, regional and even some national accounts have turned to PJs since the digital convergence began in the late 1990s. The reasons for this shift vary. Obviously, PJs are slightly less expensive because our overhead is much less than large commercial studios. Also, PJs are renown for our speed from call to delivery. PJs, who accept last-minute commercial gigs, can literally get a call in the morning, arrange the location and models, and deliver pre-pressed, absolute-released (model and property released) digital images around the globe within a few hours. 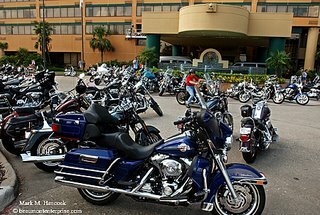 Additionally, commercial photographers tend to congregate in large, industrial cities. Consequently, PJs in more rural settings are often the best qualified professionals for hundreds of miles. All this aside, PJs have a major edge over traditional commercial photographers particularly when a client needs to tell a story. PJs are story tellers. We've seen how this applies to wedding photography, but advertisers are starting to apply this talent to commercial applications as well. As mentioned above, commercial photography is fiction. It's not a large step for a journalist to write a fiction story. After all, journalists tell stories every day. They understand dialog, pacing and all the other elements of a good story (factual or fiction). The same holds true for PJs. PJs can tell stories for any client. Although most of us prefer to tell honest, factual stories for newspaper and magazine readers, sometimes it's fun to tell a fictional story for a commercial client. This is precisely why they go the extra mile to hire PJs - to tell a story about their product. Often advertising stories are rather two-dimensional (no pun intended), some superficial characters (actors) meet for lunch at a place (typically the client's) and have a laugh or toast some fictitious milestone. Other stories actually get to tell a deeper story (although not too deep). The story might be about a hard-working co-ed softball team challenging the city champions, winning and enjoying their favorite beverage at some local hangout. The previous example sounds simple enough to most PJs. We've shot the real thing over and over. So, we know what typically happens. We could easily tell actors how to behave to mimic (or perfect) our best shots from the real versions of most of these stories. Idealistic PJs probably just started squirming. Remember these images are for a commercial client (i.e. fiction). If we don't make the images, someone else will. Either way, someone is earning a few grand for the shoot. Breathe, it's NOT news. Unlike the reality we've shot so many times, we get to select the players, the field, the time of day, where they are arranged, etc. The only thing we probably don't choose is which beverage they choose for their celebration. The product for this shoot is probably the beverage. However, depending on our contract, we might be able to swing secondary sales with the uniforms they wear (sponsors), the local hangout or even the vehicle they use to move from one place to another. Extremely high-dollar clients won't allow piggy-back work on the shoot. However, if we give smaller clients a break, they actually prefer the arrangement. Not only do they save on the initial shoot/model fees, their product may be seen in another ad. It's a win/win for smaller clients. From the shooter's point of view, it's better to glean $2K each from four clients simultaneously than $4K from one client. It creates a little more back-end work (after the shoot delivery), but it's works out amicably for everyone. Unlike news PJ, commercial photos rarely have cutlines or a narrative. Typically, the images are expected to tell their own story and allow the viewer to imagine themselves in the place of the models. Consequently, it's easiest to think of a commercial shoots as stills from a movie. Frequently, the photographer is also the artistic director of this mini-movie, but sometimes the client employs an art director to handle the shoot. We can talk more about art directors some other day. For brevity, we'll consider this a shoot for a local client and the PJ must deliver everything for the client (this makes it more fun for us). When the photographer talks with the client, it's important to learn the exact expectations of the client. Otherwise, the client won't be happy with the final results. Our main concern on commercial gigs is to make the client happy and deliver exactly what they want. If they want two guys shaking hands in front of a sign and they're willing to pay $4K to get it, that's exactly what they'll get by golly. If they are open to letting the photographer have creative latitude, it can become a guilty pleasure for PJs. It becomes more work for the same pay, but it's a chance for the photographer to shine. If the client leaves the details to the photographer, it's good to offer some suggested shots or develop a story line for the client. This allows the client to refine or reject ideas before it's too late. Get specific requirements from the client while talking and write them all down. Clear up any potential problem issues during this discussion. For example, it's difficult to make motorcycles burn underwater. It can be done, but the cost is significant. When shooting, be certain every requirement is met. Since this is a commercial shoot, there are no excuses. The camel (or whatever) must do exactly what's required because the commercial photographer can make it keep doing the same thing over and over and over until the image is perfect. Always remember there's typically thousands (or millions) of advertising dollars being spent on the back end of this deal. When the client is considering an entire brochure, campaign or booklet, the photographer can often suggest a story line. Offer an extremely detailed story line to avoid client confusion. This requires the photographer to provide answers to the common journalistic questions (who, what, when, where, why and how). Unlike a news story, all these factors are the responsibility of the photographer. So be careful with the details (hint: don't suggest using a pumpkin motif in April). 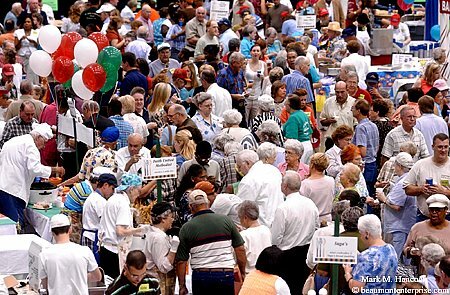 It's also important to discuss precise demographics of the models (age, gender and ethnicity). If the client leaves model selection to the photographer, lean heavily toward attractive models with middle-gray reflectivity skin tones and confusing ethnicity. It makes metering easier and these models tend to be neutral enough to make everyone happy. Before we proceed, understand logic and logistics don't apply in commercial photography. Tell the story and ignore logic. 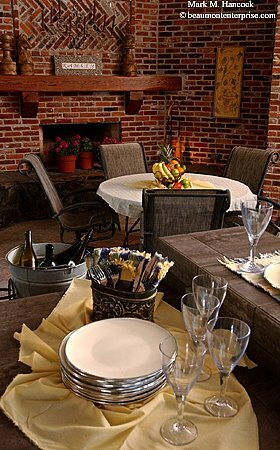 Commercial clients and their customers are happy with an illogical lifestyle. As they say, sell the sizzle - not the steak. It's important for everyone to understand the story line. The commercial photographer, the client and all models must understand the story to make everyone happy. A couple arrives for their blissful anniversary vacation at this inn. They breathe in the fresh air in the morning light outside the inn. Inside, they're greeted by a friendly and attractive desk clerk. Their bags are carried to their room by an attractive bellhop. The couple sees the room and all its lush features (detail shots). The couple has a great lunch. They are served perfect meals (more detail shots). After lunch, they lounge in a hammock by the lake at sunset (remember logic doesn't apply). Then, he plays golf with his handsome friends (don't ask where they came from) while she goes to the spa for a massage (avoid including the masseuse unless a specific gender is requested). After the shortest game of golf in known history, they decide to drive down a lovely lane into the sunset with the top down (the sunset is stuck on pause). They arrive in a limo at the most exclusive restaurant dressed in formal evening wear (it's a magic car). They dance. He dips her during a tango while she holds a rose in her teeth. They meet friends from across the globe and all laugh by the fireplace. Then, they sleep soundly (smiling with perfect makeup) as the sun rises past the lace curtains. 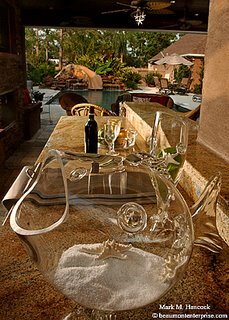 They teleport through a clean-and-perfect-hair machine to the restaurant and are instantly served the finest breakfast (more detail shots) by a different attractive server or the head chef. Let this idea stew a little. Most PJs can see some potential clients in their hometowns. They can also see a few piggyback deals from the story above. Again, I'll emphasize the importance of PJs discussing freelance policies with their employers before accepting gigs. Commercial gigs are a way to augment income and afford the nifty equipment we've needed. These gigs can also reduce those educational expenses we've racked up. I plan to post more information about commercial work. Although most PJs consider commercial work "the dark side" (as in "come to the dark side"), it allows for a creative release, potential income and actually may produce future ad revenue for the paper once local businesses have quality images. As long as no conflicts of interest are created, consider commercial options. I back-posted a commercial photo story. The rough narrative is it's a great place to meet friends or be alone. The upscale coffee shop has meeting rooms for businesses and Wi-Fi for individuals. They offer food and custom coffee drinks for busy executives. They also offer thoughtful gifts for anyone's needs. As explained above, the narrative is fiction, so feel free to create your own story line. 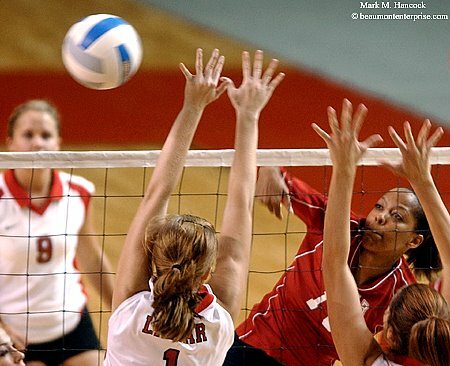 Lamar's Courtney Mitchell (No. 10, right) spikes the ball past Lauren Holdorff (No. 1, left) during the annual Red-White volleyball scrimmage at Lamar University in Beaumont on Monday, Aug. 21, 2006. 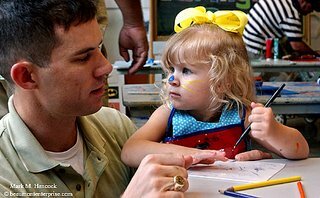 Scott Binagia of Beaumont (left) gives drawing instructions to his daughter Avery Binagia, 2, (right) during the Free Family Arts Day at the Art Museum of Southeast Texas in Beaumont on Saturday, Aug. 19, 2006. 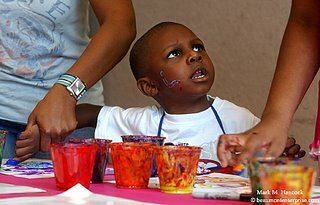 The event featured hands-on art activities and entertainment. Chase Davis-Vital, 3, of Beaumont gets irritated when another person dipped into his favorite finger paint color during the Free Family Arts Day at the Art Museum of Southeast Texas. Reagan Cowart, 4, of Beaumont finger paints during the Free Family Arts Day at the Art Museum of Southeast Texas. 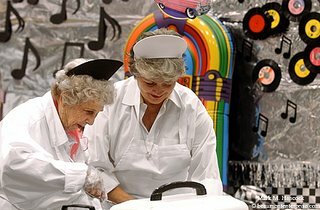 Peggy Yancey (left) and June O'Rear with the First Baptist Church prepare food samples during the Tasting for Some Other Place at the Beaumont Civic Center in Beaumont on Tuesday, Aug. 22, 2006. Proceeds from the event support Some Other Place, a faith-based mission that provides emergency services for the less fortunate. Guests taste chocolate-covered food samples at the Courville's booth during the Tasting for Some Other Place at the Beaumont Civic Center. Randall Hughes serves food samples at The Apostolic Church booth during the Tasting for Some Other Place at the Beaumont Civic Center. 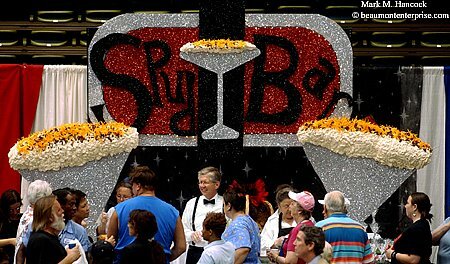 The booth won first place for decoration. Guests taste food samples during the Tasting for Some Other Place at the Beaumont Civic Center. Please see additional photos on Fayrouz's Chaldean Thoughts blog. 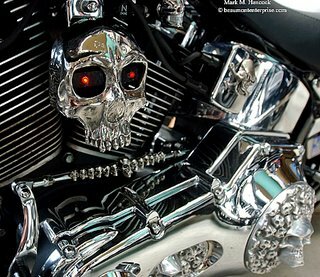 Matt Willis' Harley-Davidson Fat Boy motorcycle features 255 skulls at the Hotter-N-Hell Motorcycle Rally at the MCM Elegante Hotel in Beaumont on Sunday, Aug. 20, 2006. Matt Willis of LaPorte, Texas drinks a cup of coffee before his ride home after the Hotter-N-Hell Motorcycle Rally at the MCM Elegante Hotel in Beaumont. 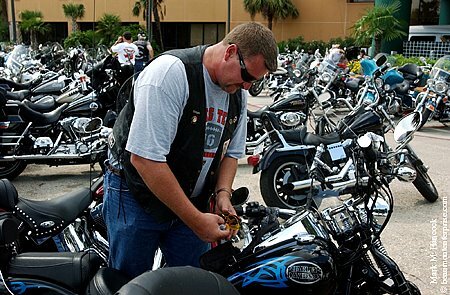 The annual rally features live bands, a bike show and contest, bikini contest, tattoo show, vendors and door prizes. 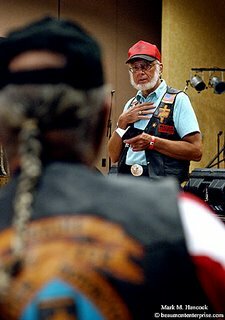 League City, Texas resident Stacy Huggins (right), area preresentative for the Christian Motorcyclists Assocaition, gives his sermon to Dwaine Johnston, president of the Trinity Travelers chapter of CMA, during Sunday services at the Hotter-N-Hell Motorcycle Rally at the MCM Elegante Hotel. 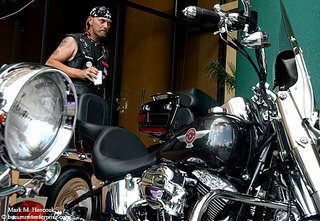 Rick Orr of Highlands, Texas prepares his bike for the ride home after the Hotter-N-Hell Motorcycle Rally at the MCM Elegante Hotel. Sharon Johnson of Houston starts her trip home after the Hotter-N-Hell Motorcycle Rally at the MCM Elegante Hotel. 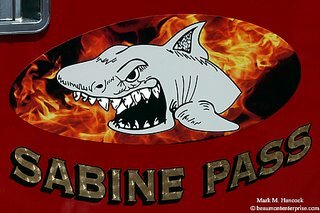 The new Sabine Pass fire engine sports a custom shark logo to match the school's mascot at the Sabine Pass School in Sabine Pass on Friday, Aug. 18, 2006. E-one of Ocala, Fla. donated a new fire engine to the Port Arthur Fire Department's Sabine Pass station as part of the "Extreme Makeover: Home Edition -- After the Storm" series. Pre-K teacher Tracie Billeaud (right) and her class examine the community's new fire engine at the Sabine Pass School in Sabine Pass. 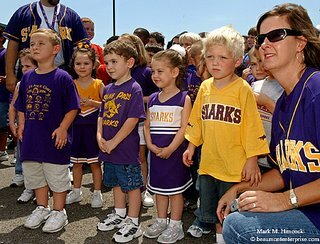 Much of Sabine Pass was irreparably damaged when Hurricane Rita made landfall directly above the community. Firefighter David Simmons (right) explains parts of the new fire engine to students at the Sabine Pass School. 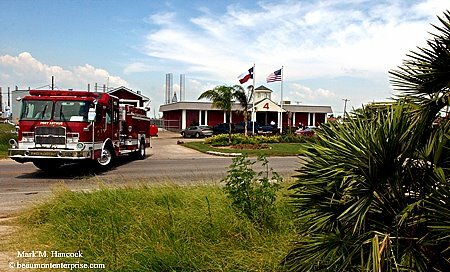 Firefighters were presented with a new "loaner" fire engine during the taping of Extreme Makeover. The new one is permanent. 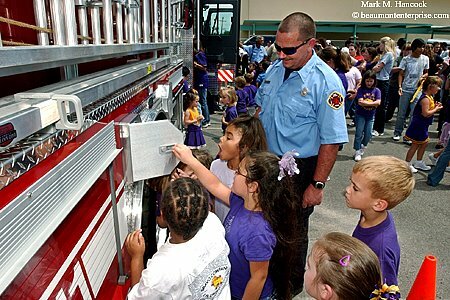 Sabine Pass School students are the first in Sabine Pass to inspect the community's new fire engine. While most of the historic community has been demolished, many remaining residents live in trailers next to their blue-tarped homes. The community's new fire engine backs into the station in Sabine Pass. 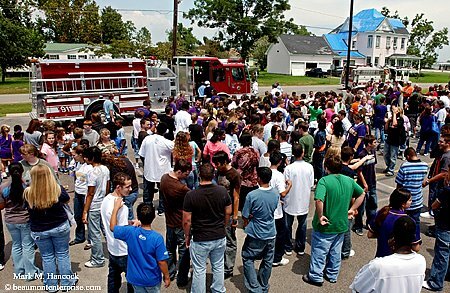 Because the community was so badly damaged, Extreme Makeover tackled projects to help the entire community including the fire station and the school's theater. The station was gutted and rebuilt in four days. Please see additional photos on Fayrouz's blog. 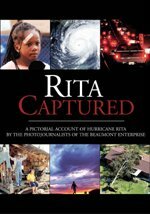 For additional coverage, please see Mark's Hurricane Rita visual timeline. Tim Hill of Orange gets a clean start during an IHRA time run at Ben Bruce Memorial Airport Raceway Park in Evadale on Saturday, Aug. 19, 2006. State troopers Jeremy Carraway (left) and Lester McCray (right) investigate Monday's fatal truck wreck on Interstate-10 near mile marker 858 in Rose City on Thursday, Aug. 17, 2006. While construction continues, short, uphill entry ramps are blamed for many of the recent fatal accidents along the stretch of freeway. Please read Jeremy's bio and see his images. Ed note: This interview was conducted via e-mail. Jeremy wrote all his answers while serving in Iraq's war zone. He also agreed to handle any follow-up questions in the comment section of this post. What general advice do you have for young photojournalists? 1. Find a mentor or mentors. Someone you can bring your work back to and get further guidance. The mentor should be someone you can look up to and aspire to be. 2. Be able to take constructive criticism. If someone doesn’t like your work, ask why and how to make it better? If they do not give you a reason, find a different mentor. 3. Your name means EVERYTHING in this business. We can all go out and take a good picture, but are you dependable, constantly meeting deadlines, promising and delivering, etc. 4. Don’t talk about it, shoot it! Is military photography a specific Military Occupational Skill, or a duty assignment? It is a Military Occupational Skill. You are trained in the job after basic training, then head to your duty assignment to perform your job. Is a degree required for military photographers? No, but It definitely doesn’t hurt and could help when you get out. I am about a semester away from my degree. How would a young adult civilian become a military photographer? I am not exactly sure about all the Air Force (AF) requirements. If you talk with a recruiter don’t sign anything until you are guaranteed the job you want, and get it in writing! I was lucky; I just wanted to join the AF for four years as an x-ray technician. I went in open general and was given a job as an imagery processor, where I worked in a darkroom processing and printing for about six years of my service. Then, the two jobs merged (imagery processing and photography), and I picked up a camera started teaching myself and found a great mentor. Fourteen years later I couldn’t be happier with my AF career. For young adults with degrees, is it possible to become a military photographer and officer? Yes you can become a military photographer with a degree, just don’t sign up as an officer. 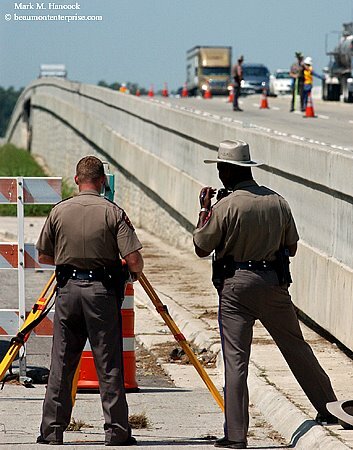 Officers don’t shoot in this career field, they manage. Understanding everything is different during war time, but what would a military photographer do on a typical day at their normal duty station? It really depends on their duty station and mission, but you can shoot everything from ceremonies, official portraits, crime scenes, aerial photography and stories for the base newspaper. Each base is a small community, so you would be covering it like a newspaper would cover a small city or community. Who owns the images you make for the military? I guess the military owns them, but if the images are released they are for the public to use them. It kind of hurts the photographer to see some Joe Shmo making money off our photography. But then again it is nice to see your work appreciated. If the images are FOUO (For Official Use Only) or Not Released the military definitely owns them. What happens to the images you make for the military? Please describe the flow of information including any content screenings and how/if it is released to the public (via wire, print, online). We will either be tasked with a job or we find our own. Shoot the job, then come back edit and caption our images. Next we will take the images to Public Affairs for the releasing authority. Then we either give them to the requestor or, like over here in the war, they go to the Pentagon where the released ones get put on a server for public use where they can end up online, in magazines, books, newspapers, etc. Do you deal with access issues like civilian PJs? Yes we do. In this job you need to be outgoing and sell yourself. You also need to be able to be a part of the team and not a liability - especially in time of war. Is all your equipment provided by the military? All of the gear I use on military assignments is provided by the military. On occasion I use some of my own gear. What's in a typical issue rig? At Combat Camera, where I am stationed now, we have a big budget due to our mission. A typical issued camera bag has two digital bodies. (1 D1X and 1 D2X, soon to be 2 D2X replacing the D1X) pretty much any lens you want ranging from 12mm to 400mm. Bigger lenses can be checked out. Two flash units come with the camera. Light kits can be checked out. One monopod, a tripod, batteries and film cards. Most of the time, we have to travel light so the photographer will customize his kit to meet his and the missions needs. At other bases, it is pretty similar. Do all military PJs get the same rig? In the AF we are all not labeled PJ’s. Photographers yes, but to be labeled a PJ one has to be selected to attend Syracuse University for a year of studying photojournalism. 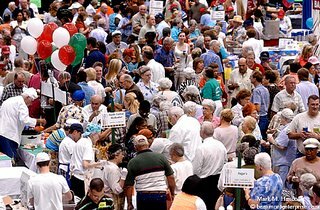 Each year all the services send five photographers that show promise and skill to attend. But to answer your question, yes, for the most part we all get the same gear. But those who work harder get it quicker. What specialized equipment is supplied to you? It all depends on the mission you are shooting. At Combat Camera we have access to underwater camera bags and night vision. What uniforms do you wear to most assignments? Again the mission dictates the uniform. Most of the time it is battle dress. Civilian clothes—yes if the mission dictates it or maybe it is a downtown job. Or overseas you need to blend in with the local community. How has being a PJ affected your life? It has been amazing; I am not only living my life but get the chance to get a feel for the lives of others I photograph. Is there a personal toll? Yes there is. You are constantly chasing down jobs, working at all hours and meeting deadlines - not to mention the stress of war. Family life is hard to balance. I am divorced with two boys. How important are writing skills to military photographers? Writing skills are very important in or out of the military. I believe you are more marketable outside the military if you can write. They don’t have to send a writer with you on your assignment. Most of the job is shooting and then writing captions. I am not a great writer, so I leave the stories to the writers. Do you work with reporters, art directors or other people? In the military, I dont work with them unless working for a base paper. Then, I would work with writers. On my PBS shoots, I work with directors. They just might ask me to get a certain shot. With everyone I work with, I give them what they ask for, but then I try and "wow" them with a better one to choose from. Tips to make it managable: treat everyone the way you want to be treated. Work through the issues at hand, and give them all something better than they were expecting (but always have the shot they asked for in the bag). What special precautions and/or equipment do you take when you're going to a combat area? Well, lucky for me, I have a lot of military training that is required before we step foot in the war zone. And on this trip it has definitely worked. The training just kicks in which in turn helps you complete the mission. When I go out for a shoot here, I wear a Kevlar helmet, body armor, shooters vest with one lens (17-55mm) extra batteries and film cards, note pad and pen and some essential first aid supplies. I have a 9mm pistol strapped to my leg and carry 2 cameras (D1X with a 80-400mm lens and a D2X with a 12-24mm lens) At times I do interchange the lenses with different bodies depending on the effect or situation. With my photography I do not use flash unless I am in a studio. And for night missions I carry a night vision lens adapter, but don’t use it. I use all natural light. And I always pray for my safe return! Some rules seem to have changed since I was in the Army. I have difficulty getting soldier's names and hometowns. Please address the actual rules on this and why this has changed? When I was first over here at the very start of all of this we identified people as Soldiers, Marines, Sailors, and Airman. I guess for their safety. But now we are required to give name, rank, and unit they work for. Unless you are working with Special Forces, everybody over here doesn’t have a problem giving the info. The ones that do, I don’t need their photos anyway. What ethical considerations do you keep in mind while shooting in combat zones (civilians and military)? When editing my photos I do not do anything that can not be done in a darkroom - unless I'm creating an illustration. What are some of the ethics issues in conflict areas? Knowing when to shoot and knowing when to put the camera down and help out with civilians or military. I have not really had any problems in this area yet. I did have to put my camera down and help give first aid to a civilian who was shot because there was only one guy helping and he needed help. In my experiences the people I am photographing know I am there, so act accordingly. If something did go amiss I would like to think I would stop it or shoot what’s going on and let the higher ups deal with it. Until you are put into that situation, you don't know. 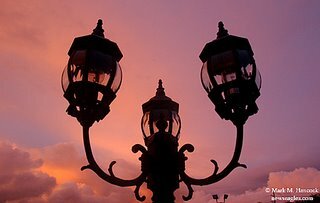 How did these instances affect you, and did your emotions impact the way you approached a photo? I have not encountered any ethical issues over here. I did, however, have one when I was working on a story in a neo natal intensive care unit very early in my career. I was shooting a family that gave me permission to shoot them and their baby died. Although I had permission I couldn’t bring the camera to my face. Later I talked about the situation with my fellow photographers and we all agreed, as long as I wasn’t obtrusive to the family, shooting from a distance, the family probably would of loved to have the last few moments with their baby captured on film to remember. Again you just never know until you are put in to these situations. I believe if you are a good person you will do the right thing. What keeps you motivated as a military PJ? To be the best photojournalist in the military and world. On any given day anyone can achieve this. The guys winning Pulitzers have their good days and their bad days just like all of us. But they have achieved a name for themselves and a good name is everything. The other thing that keeps me motivated is we have a job that lets us meet some very interesting people. The job is never the same and there is ALWAYS room to grow. What do you see in the future for military PJs? There is talk of Public Affairs merging with our career field. It is still new, so I don’t know if it is a good thing or a bad thing. Are photo stories important for military PJs? I believe it is the most important aspect of the job and the hardest. Every assignment I shoot I approach as a story. It takes a lot of hard work, time, and criticism. But at the same time it should be fun and exciting. Great mentors that give good advice. Lots of shooting and a good dependable name. With my photography I try and make the viewer feel like they are part of the picture or show them something they would not normally see with their 50mm eye. If you could change anything along the way, what would it be? There is nothing I would change. To quote my buddy Preston Keres "life is good." If I changed something, then I would not be the person I am today. What is your finest moment? Still waiting for it to happen! I would just like to pass on something my mentors passed on to me. We have all started at the bottom; knowledge and experience not passed on is a waste. To quote Chip Maury, one of my mentors, "PASS IT ON AS FREELY AS YOU RECEIVED IT." Thomas Stargardter, photo editor for the national newspaper in Managua, Nicaragua asks, "Your civil war project impressed me alot. How where the images created and proccesed?" Thanks for the kind words on my Civil War project! One part of my documentary was the civil war re-enactors. These guys were passionate about what they did, and that’s when my documentary took a turn. I just focused on them. It took a year to shoot the story. Over that year I shot 3 re-enactments, each a 3day event. (Antietam, Perryville, and Gettysburg). Most of the year was going to their drills and meetings, getting to know them. When I shot the battles, the guys I was documenting were all authentic. Nothing modern could be used or shown. I had to dress like them, be one of them. Well this posed a problem with my camera. One of the wives sewed a burlap bag together with a rope strap that my camera could be concealed in. Then two holes were cut into the bag, one for my eyepiece, the other to put my lens through (then wrapped and sting tied to conceal the lens). Each day of the re-enactment had 3 battles, I only brought one lens into each battle, switching lenses to force me to look for something different. And for one of the battles each day I sat the sidelines with the spectators and shot from their point of view. As far as shooting, I researched and looked at various images from that time and tried to imitate them. Ex. Blurriness from slow shutter speeds, slightly out of focus, and set up portraits. Then in post production, I turned it into a duotone print by finding two colors that gave me the effect I was looking for and fine tuned the photos with some dogging and burning. Roadblocks I had to overcome: We are in a modern time. I had to shoot around power lines and other man made obstacles. Also there are thousand of spectators that come to these things shooting around them was also very difficult. On another note: For my first shoot on this project I stopped and shot Antietam on my way home from the Eddie Adams workshop. While at the workshop I learned what layers in a photograph were and at the workshop I had a hard time seeing it. At Antietam I created my first real photograph (and my favorite picture) with layers in it. My shooting hasn't been the same since. The photo is of a confederate soldier in the bottom left corner looking at the camera with a soldier in front of him with his head cut off, a soldier on a horse behind them both with a pair of men behind them, lastly another man on horse in the far back. In the comments section, Jason asked, "Mr Lock, I am studying to be a PJ but family is the most important thing to me. Did you find it hard to leave your family so often for deployments? In defining your "finest moment" what would that be? A perfect photo? Video? How is a finest moment defined in your life or career or how pick it?? Thanks I know you are busy good luck and be safe!" Let me start with redefining my finest moment. My two sons are by far my finest moment in my life. In the interview I was basing all my answers toward photography. As you will see, in the photojournalism career you are always chasing a story, and the story, whether it is chosen by you or an editor dictates the time you work and for how long. And then you have deadlines you have to meet. It is a hard job with a family, but it can be done! I guess you have to find a balance that you and your family are happy with. This was my downfall. But I am finding the balance. As for defining a finest moment, maybe it is a photo or an experience, or a photo that brought about a significant change to the world. To me, it's not winning some award. Contests are great and let you know how you are doing amongst your peers, but photography is so subjective and could sway either way on any given day with any number of judges. Again great question, you really made me think. Good luck with your journey! High school student Robby Barthelmess asks, "Thanks for sharing this really interesting interview with all of us. Your photographs have really inspired me and allowed me to learn from them. Jeremy, your work is amazing. I can't think of words to describe it. Thanks for capturing all of those moments and sharing them with the world. Your job sounds awesome and very interesting, no two days must be the same. As a high-school-photojournalist, your comment about mentors is right on. I have found myself a really great mentor via my internship with our local newspaper. He has helped me so much. Mark, I wrote to you before about colleges for with PJ programs and I have found RIT to be a very nice school. I will be applying there (along with a couple of others)later this year. Thanks for all of your advice and work on this website. I have learned a ton. This blog is has been a great help for me. Thanks for doing what you do." Good luck in the future with your photography! RIT is a great school, which is where our PJ school used to be a long time ago. But being a Syracuse grad I would have to say, "Go Orangemen!" Again you are right on with the mentor, but find a couple that you can get various critiques from then mull them over and pick from. I tend to do this and then go with my gut feeling. Again thanks for your interest, and if you every need a critique just send some photos my way. Jon Adams stated in the comments section, "Thank you for doing this interview. In 5 weeks I will be leaving for Marine bootcamp to do photography (unless my recruiters have lied...). Many of the questions the recuiter wouldn't know Jeremy Lock answered in his interview. I really appreciate the time and effort both of you took to do this interview and give a little insight to someone like me who is about to get started as a military photographer. Thank you again." Good luck to you! Please keep in touch, I would love to hear about your progress. And once you are at your first base, maybe I can point you in the right direction to some great people to mentor you. Also, keep in mind the Military PJ program and every year in June at DINFOS (your photography school) they hold a DOD Military Photography workshop. I highly recommend both!!! Denny Romero of Art Signs paints a mural on Bradley's Altered Dimension shop in Port Neches on Thursday, Aug. 17, 2006. Heat and humidity are expected to make all outdoor activities uncomfortable through the weekend. 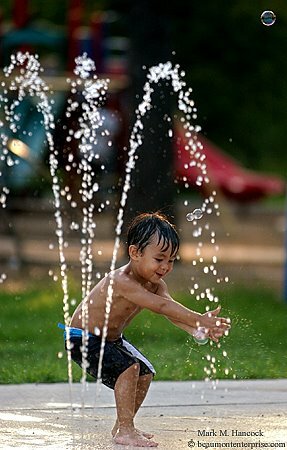 Nathan Vo, 2, of Beaumont pops soap bubbles at Rogers Park in Beaumont on Tuesday, Aug. 15, 2006. This week's warm weather has drawn many residents to the splash playground at the park. Jerry Thacker of Beaumont works on his inline skating form at Tyrrell Park in Beaumont on Friday, June 23, 2006. 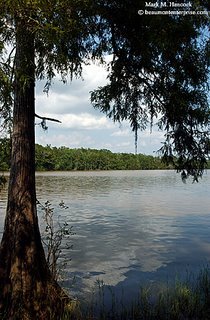 Since Hurricane Rita, the park has planned many renovations to ensure its place as a jewel of Beaumont. 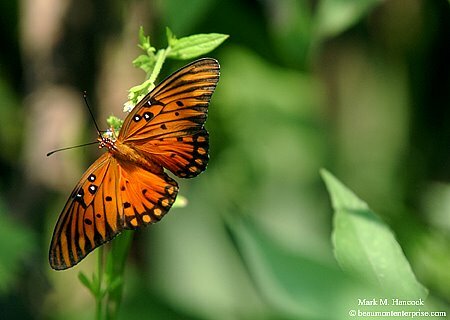 A butterfly searches for nectar in the area proposed for an outdoor learning center at Collier Ferry Park in Beaumont on Wednesday, Aug. 9, 2006. The center is a joint project of the City of Beaumont, Lamar University and others. 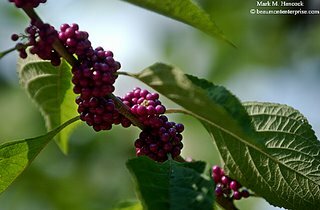 American Beautyberry (Callicarpa americana) grow in the area proposed for an outdoor learning center at Collier Ferry Park. A cypress tree grows beside the Neches River in the area proposed for an outdoor learning center at Collier Ferry Park. 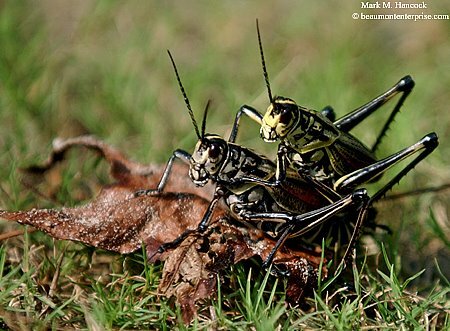 A grasshopper catches a piggy-back ride on another grasshopper in the area proposed for an outdoor learning center at Collier Ferry Park. Sunlight refracts through clouds during a tropical shower in Beaumont on Tuesday, July 25, 2006. Even folks unacquainted with the nuances of style can accurately identify which images belong to different photographers by the way the finished images look. As casual observers flip through the pages of their favorite newspapers or magazines, they can easily spot images taken by a particular PJ. Over time, they learn to look for (or avoid) images produced by specific PJs. They may never look at the credit line, but they know how these images look and where the images tend to appear. Style is an often misunderstood term. 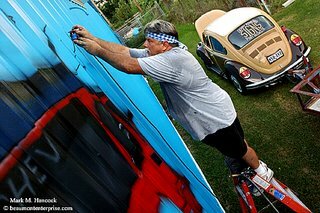 Style is the way an artist approaches art from beginning to end. A style is a consistent combination of choices. Often an artist's style falls within one broad category and is further defined by the artist's preferences, skills, equipment choices, subject matter and final image treatment. All accomplished artists have their own style - whether they know it or not. It's simply how they do what they do. A style is a reflection of the artist. Like a fingerprint, the work is easily identified as belonging to a specific artist. Some artists realize the importance of style and make a conscious effort to deviate from their peers to stand alone. 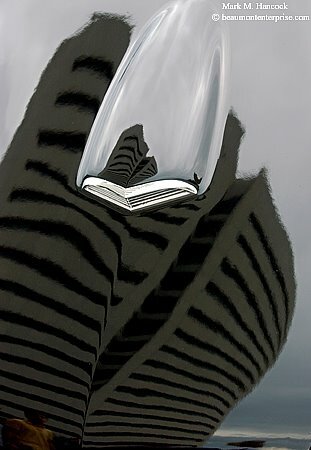 Separating oneself from the crowd occurs in everything from writing to sculpture to photography and beyond. People already understands style but may have never thought of it in a visual context. Let's look at personal styles and understand how style works in general. Each morning, people around the world wake up, clean up and display their styles for others to see. A manager wears a pinstripe suit. She may wear high heels. She may pull her hair back. This is her style. Another worker puts on his blue jeans, snap-front shirt, boots and hat. He probably adds spurs and chaps depending on where he works. We know this man's profession simply from his clothing style. Tools of the trade also determine style. When we consider music, we try to organize songs into different styles. If we see a musician preparing for a show, we can often ascertain their musical style by both clothing and instruments. For example, we see a person in jeans and boots preparing a pedal steel guitar. We know this person's exact musical style. Unless s/he is a cross-over artist of some sort, this person performs country and western music. Believe it or not, the same holds true for different photographers. Although photographers do shift styles for different assignments, this quiz should encapsulate many photographers by both their clothing and camera selection. The answers are at the bottom of this section. See if you can name the photographic style and the photographers. 1. Business suit and tie with a medium format or 35mm digital camera. 2. Khaki trousers, white button-down shirt, view camera. 3. Blue jeans, flannel or polo shirt, sneakers or boots, 35mm digital camera. 4. Trendy business casual, view camera. 5. Black turtleneck and trousers, medium format camera. Again, these styles simply identify many people in these fields of photography. Not everyone fits neatly into these molds, but we should get the point. Now, consider your own camera and what's in the closet. Even if these don't reflect your profession, they say a lot about your style. One of my college friends turned out to be a fine fashion/travel photographer. He has acquired many skills over the years and amassed a good portfolio. However, his college experience serves as a lesson. After our first two years of college, he and I went to different universities to complete our bachelor degrees. My university emphasized the technical aspects of photography and journalism while his university focused on the artistic aspects. While I was learning chemistry and refining techniques in printing, lighting and portraiture as well as intense journalistic training, he was being encouraged to find his individual artistic style. His instructors helped him choose his style. Did you hear a needle rip across the record? Yup, while I learned a plethora of photographic techniques and the minutia of densitometry, he was busily working on his "style." 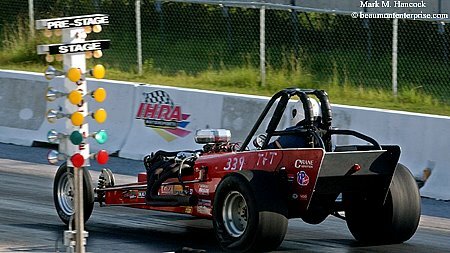 What was the style his instructors decided he needed to follow? Available light images of amateur female fashion models shot on 3200 ISO B&W film. He was responsible for his own printing technique because it was part of his supposed style. I tried to convince him that he was being sent down a wrong path. The style he chose - since he called it as such - wouldn't allow him to make a living. He heard none of my warnings. I graduated with a B.S. degree and a solid background in photography and journalism. He graduated with a B.A. degree and an artistic "style." I worked freelance gigs at different publications and landed a staff job after a few months. He struggled for several years trying to find work through hair salons and such. Luckily, his family had sufficient wealth to support him. As I said earlier, there's a happy ending to his story. However, it took at least four years for him to get his total technique up to a professional level. Now, he shoots mostly fine-grain (low ISO), saturated color images with studio strobes in exotic locations. His specialties include fashion, weddings and commercial work. In other words, he's doing the exact opposite of the "style" his instructors thrust upon him. This was a long story to explain the importance of refining technique before worrying too much about style. Again, style is a reflection of the artist. It can't be forced. If a particular photography style is adopted before all options are tested, the style can't possibly match the artist. Ignorance isn't a style. The first major step is to determine which genre of photography is best for the photographer. This is determined by individuals' goals and inclinations. Often, a set of questions direct photographers in the right direction. the creative process --> fine art. Each question directs photographers toward a specific field. Although several questions may be options for the right photographer, most are one-way tickets. When PJs think about education, we think about a formal degree (bachelors or masters). This is because many people want to be PJs. So, employers require the degree to eliminate candidates. Unless the candidate already has a Pulitzer Prize, can speak 20 languages, etc. the first cut is always those without degrees. However, in other photography fields, a degree isn't always the starting point. Although I believe a degree is useful in any field of photography, some photo-related jobs don't require a degree. Many successful portrait and commercial photographers have no degree. Instead, they went through an elaborate apprenticeship or mentorship and learned on the job. They found an employer or mentor to teach them the entire business in two years. While they may initially get a two-year jump on their competition, they take a huge risk by learning a specific job without enough general education to react to market changes. In other words, if the market dries up, they may not have the background to shift gears and survive the change. Either way, photographers need to seek the best education they can. If the photo student goes to a university, go to the best-qualified university per dollar. Find one with proven results in the desired field or one with a wide array of successful graduates in a number of different fields (possibly a better option). If a photographer plans to enter a field other than PJ work and prefers to enter a mentorship arrangement, make sure it's with the absolute top photographer in the field. Lately, even these top photographers are culling the herd by demanding degrees, but it's still an option. If a photographer does choose this route, it would be extremely wise to have a specific contract of terms with the mentor. After the mentorship period ends, it would behoove the photographer to immediately move into a second mentorship with a different photographer for a shorter period. This second experience should fill-in any educational gaps from the first experience. Once the best field and the right educational route has been chosen, get the right equipment. Photography equipment is outrageously expensive. PJ work has one of the least expensive starting points at about $10,000. So, imagine the cost of a professional view camera, a full set of studio lights as well as a studio or other storefront. Consequently, it's vital for photographers to understand enough about themselves to invest their money wisely. Sinking cash into a serious view camera and then deciding medium format is more appropriate costs the photographer about the same as pushing an uninsured car off a cliff. But, it's only money and time. In commercial photography, specializations of style are quite pronounced. A commercial photographer may choose her/his style to be neon-lit, flowing water over lava rocks with a 8-by-10 view camera at f/64. This commercial photographer may be known worldwide for this particular style. Anytime a commercial client wants their product to be seen with this treatment, they know exactly whom to call. Extreme specialization is a result of market demand. Although most established commercial photographers can do an exquisite job on any product, they corner certain markets by specialization. This ensures their survival through their unique expertise and depth of experience in a specific treatment. 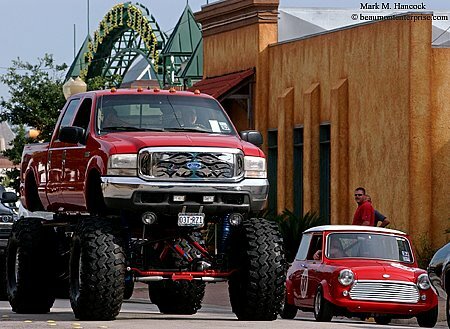 Auto manufacturers, for example, depend on a specific set of commercial photographers for their various products. The job requires a photographer to capture a large, highly-reflective object with a large format camera (for larger-than-life displays). Another specialist may be employed to capture the auto traveling through the mountains in perfect light with an evocative background. A third specialist may be employed to set the vehicle on a mountaintop via helicopter and shoot it from the air or another mountain location. All these commercial photographers are specialists. They already have experience and proven results with these extremely difficult assignments. Clients contract with these specialists because there's too much money on the line with the new product. The client wants to be absolutely certain the job is done right by a specialist. As we discussed before, photojournalism is a field of photography. As such, it is also a style of photography. A photojournalistic style - at its optimal level - is an ethical and compelling marriage of words and images denoted by emotional, factual story-telling images from a neutral observer. Because photojournalistic images are juxtaposed with words, the images frequently capture visual verbs. The camera used by most PJs is a digital SLR (single-lens reflex), also called a dit. This allows PJs the widest variety of lenses and accessories as well as the fastest means of quality image delivery. As digital video increases in professional applications and quality, it's gaining some ground for daily assignments, however it currently isn't as versatile as the SLR. Out of necessity, most PJs are generalists rather than specialists. They must be able to handle any assignment thrown at them. However, most PJs still lean toward certain specialties based on their interests, abilities, experience and equipment. Although all PJs can capture mug shots in their sleep, some large-newspaper PJs tend to get more sports, illustrations or crisis assignments than other shooters. Unless a PJ is a "one man band" at a small paper or magazine, specialization and preferences begin to establish the shooter's style. A PJ's style is a series of incremental steps over several years. Although a young PJ fresh out of college could be thrown into a war zone and produce images, the PJ's likelihood of survival or image quality is questionable. Even if they do survive, their ability to function as a human afterward is highly unlikely. Typically, newly graduated PJs either dive into the editorial freelance market (a harsh reality) or try to land a job at a smaller newspaper. Either way, they must immediately learn the lessons they were never taught in college. They must learn how to make a living with a camera. They must learn what photography is worth and a long list of other professional issues. These are lessons best learned while not ducking bullets and bombs. The mental challenges and ethical dilemmas of PJ work also requires some on-the-job training and experience before young PJs are surrounded by an entire country of starving people. Just as an athlete must slowly break down muscle to build more, PJs must suffer along with subjects at higher and higher levels of anxiety until they can at least function while documenting inhumane conditions. I'm not minimizing the anguish of a person loosing their home to a fire in America, but it pales in comparison to African genocide. Young PJs must be able to calmly and compassionately document the first story if they ever plan to mentally survive the latter. The ethical code of behavior for PJs creates the overarching paradigm of the style. Unlike other forms of photography, PJ work has a relatively strict code of ethics to ensure images remain truthful. These ethical considerations aren't optional - they're required. Most other forms of photography intend to sell products and services or are lumped into "art" categories, which have no ethical limitations on final images. However, when working as a PJ, photographers from other specialties must conform to the PJ ethical code or their work won't be accepted for publication. As mentioned earlier, individual style is unique to each PJ. Each part of the PJ factors into the final images. Some easily noticed style differences might result from uncontrollable factors such as height, gender, race or optical predispositions (near or far sightedness, dyslexia, missing eye, color blindness, etc.). 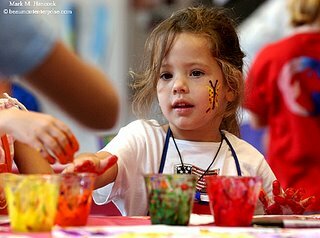 Other style differences may result from environmental backgrounds such as native language, country of origin, a PJ's parent's income, pet ownership and more. None of these factors are good or bad. They simply "are." As such, these are as much a part of the PJ's style as anything s/he deliberately does. Like the uncontrollable factors, controllable factors often manifest in a PJ's final images. These could include education, marital status, military experience, additional languages, cross-cultural experience, world travel, property ownership and more. The controllable factors often equate to access or understanding. As PJs mature and gain experience (both positive and negative) their style evolves. Although these factors also "are," they are because the PJ chose to experience most of these factors. Deliberate choices and preferences are the most distinct and frequently separate PJs from the pack. Unlike the previous two factors, PJs act to intentionally distinguish themselves. Common deliberate factors include preferences such as backgrounds, layering, compositions, camera brands, lenses, accessories, subjects, processing, post production (pre-press), film or digital, paper or plastic, etc. In all cases, PJs make these decisions consciously or at least out of habit. Although most PJs don't like to admit it, their styles occasionally morph due to the desires of others. The most common and significant style changes come from editorial, managerial, corporate or legal changes. A night in jail could certainly change a young PJ's approach to some assignments. Likewise, a new editor with a strong predisposition for or against particular styles has a heavy influence on the PJs assigned to work with this person. For example, a PJ who loves tilted horizons isn't going to get them past an editor who refuses to run them. Consequently, the PJ either stops shooting tilts or may only shoot this way for freelance clients or personal images. PJs are relatively social creatures with an average desire to make others happy and avoid unnecessary stress. If a minor reactionary change must take place for peace to exist, PJs often make the change. If it's too extreme, they look for the nearest exit. Because youngsters read this blog, I won't name the name, but a particular art photographer is known less for his still-life images of flowers (his art style) than for his imitation of Ricky Ratt (style revealed after his death). The point is that we don't get to determine how (or even IF) photography historians classify our images. Furthermore, we don't even get to choose which image is our "masterpiece" or which images are included in our own final collection. Throughout a PJ's career, their style should be refined. It's not so much a conscious effort as a result of their experience. I see style as a luscious dessert. 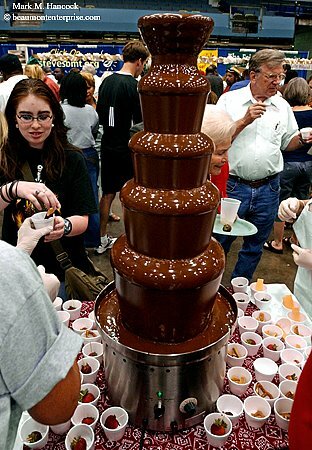 It is made of many ingredients. However, there is no recipe. We can't eat it during our lifetime, but we can taste it and add or subtract to the recipe as we acquire new ingredients. We may add some sugar to our style from portrait photography. We might add a little spice from our commercial gigs. We could subtract something after speaking with an editor. But, after all is said and done, it's simply a dessert we can take pride in. It tastes right to us. If other people don't like it, they can bake their own style. There can never be too many desserts or photography styles. A Ford monster truck passes a Mini Cooper as they line up for the Beaumont Cruise during the Texas Style Hot Summer Nites car show and cruise in Beaumont on Saturday, Aug. 12, 2006. More than 400 antique and custom autos came to Beaumont for the annual car show and cruise. The Entergy Building reflects off the polished hood of Linda Eaves' 1957 Thunderbird during the Texas Style Hot Summer Nites car show in downtown Beaumont. Car buffs inspect award-winning autos during the Texas Style Hot Summer Nites car show in the Crockett Street entertainment district. 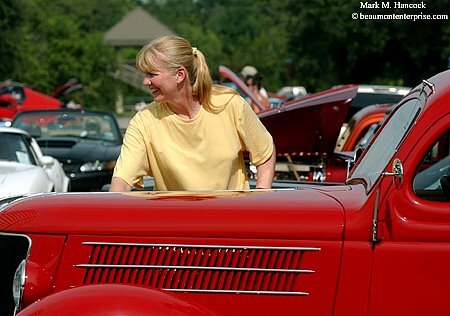 Patty Fowler prepares her 1936 Ford before the Texas Style Hot Summer Nites cruise. 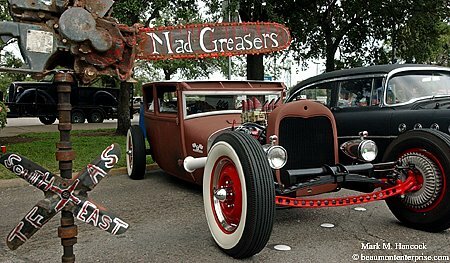 Bobby Andress' 1927 Tudor with the Mad Greasers auto club is displayed during the Texas Style Hot Summer Nites car show. 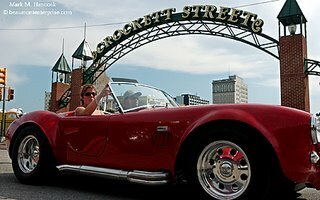 Karla and Mike Kelly of Chicago move their 1965 Shelby Cobra into position past the Crockett Street Entertainment District before the Texas Style Hot Summer Nites cruise. 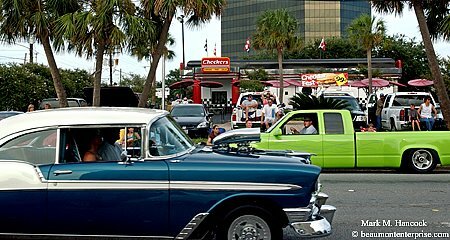 Classic and custom car fans watch the cruise from the parking lot of Checkers restaurant's during the Texas Style Hot Summer Nites cruise on 11th Street. Classic car buffs gathered at the Pig Stand during the Texas Style Summer Hot Nites cruise. Check Fayrouz's blog for more photos. 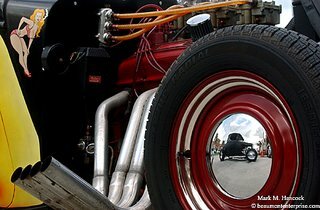 Walter Boyd's 1931 Model A reflects off the hub cap of Chris Willett's 1934 Ford during a Kick-Off party at the Cowboy Harley Hog House in Beaumont on Friday, Aug. 11, 2006. 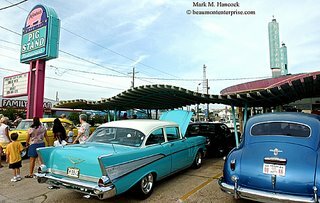 The annual Texas Style Hot Summer Nites cruise continues throughout the weekend. Merle Booker poses for a portrait at her home in Beaumont on Tuesday, August 1, 2006. 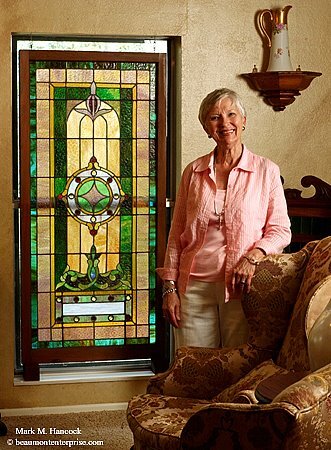 The stained glass in her home is from the previous First United Methodist Church in downtown Beaumont. 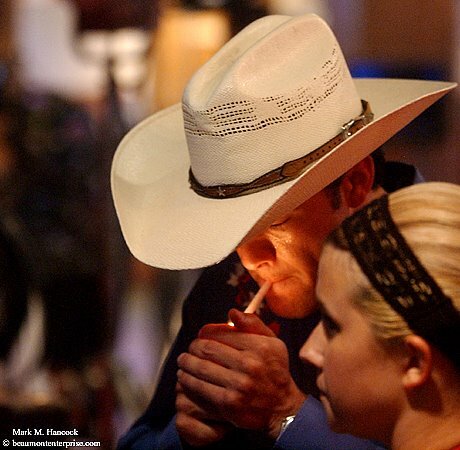 Brett Moses lights a cigarette during a break in the filming of "Noble Things" at the Dixie Dance Hall in Beaumont on Thursday, July 13, 2006. 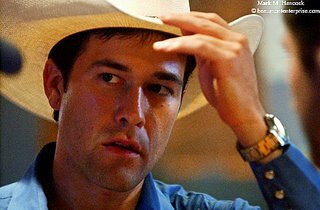 Moses, who is originally from Vidor, returned to Southeast Texas to film a movie about making it in the country music business. 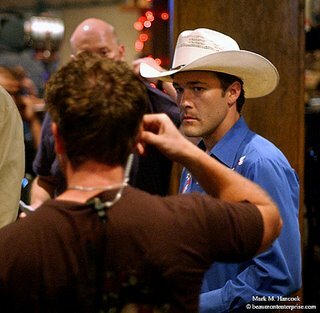 Brett Moses considers options break during the filming of "Noble Things" at the Dixie Dance Hall in Beaumont. Other Texas music stars in the movie include Tracy Byrd, LeeAnn Womack and Clay Walker. Brett Moses takes a break from a scene rehearsal during the filming of "Noble Things" at the Dixie Dance Hall in the Crockett Street entertainment district.